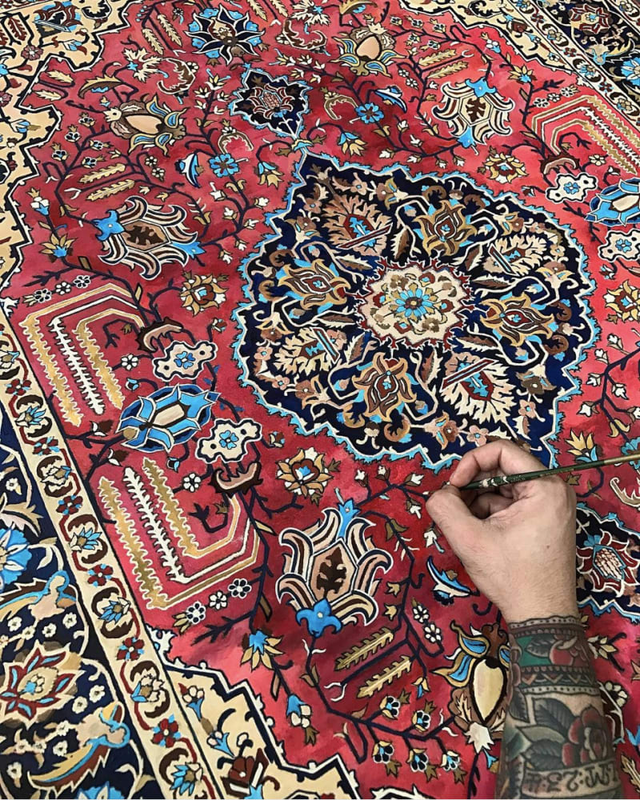 Miami-based Jason Seife experiments with symmetry and geometric shapes to paint highly elaborate adaptations of the patterns found in traditional Persian rugs. 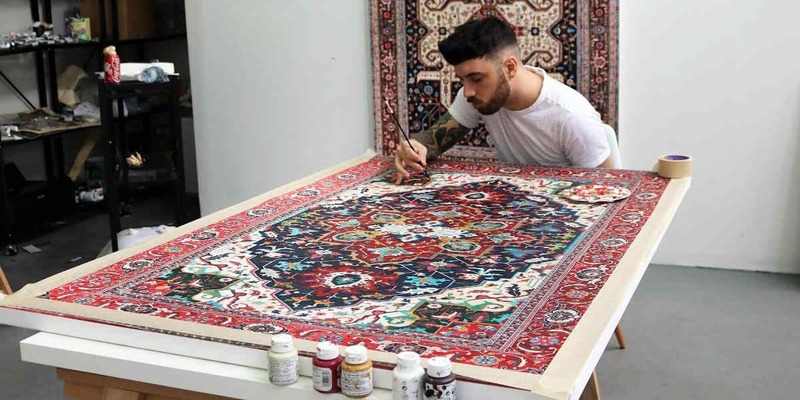 Jason Seife uses both acrylic and ink to create luxurious paintings of Persian rugs by combining tightly-merging rendered images with bright impasto strokes. His works share a deep-seated connection to his emotional state - each colour and pattern specifically correlates to Seife’s state of mind at the time of painting, and as such, his series represent a chronological timeline of Seife’s mental state discreetly embedded into his works. The inspiration for Seife’s work is based around the notion that we can reinvent the past using modern day materials and compositions, allowing the excellence of an old craft to be admired by a younger generation. Seife was inspired by both his own Middle Eastern heritage and the complex artwork of Persian rug weaving tradition. The original designs are laden with hidden meaning and language; the weavers were able to link each rug's particular pattern, palette, and style with a specific and identifiable geographic area or community. Seife’s influences span the realms of art, architecture, performance and music, and has been a lifelong admirer of KAWS for his ability to take his creative work into so many outlets, as well as multidisciplinary artists such as Daniel Arsham, Jose Parla, Takashi Murakami, and Kanye West. Seife grew up in Miami to immigrant parents who were supportive of his creative ambitions. After playing in bands throughout his adolescence and still wanting to be involved in music in some capacity, Seife was initially drawn to graphic design, and began designing album artwork for hip hop artists. He designed Big Sean’s lion logo, painted backdrops in Nicki Minaj’s music videos and created artwork for both Pharrell Williams and Mac Miller. Seife began to realise that his work within graphic design was entirely based around bringing the ideas of others into fruition, and not, as he would have prefered, bringing his own ideas to life. With financial backing from his career in graphic design, Seife made the transition into creating contemporary artwork full-time in 2015. Seife has had successful shows both domestically and internationally and was recently featured in a special project with The Bronx and Brooklyn Museum where his work was projected on the facade of both museums at a larger than life scale.